Reference number for this case: 11-Oct-54-Meaux. Thank you for including this reference number in any correspondence with me regarding this case. The regional newspaper Le Havre for October 13, 1954, reported among other observations, that on October 11, 1954 by one Mr. Jules Lefranc, a bank employee, living in Paris. He saw in the sky, near the stadium François-de-Tessart, in Meaux, for about three minutes, an object brightly lit "from the inside" which, he said, was shaped like a small soccer ball. This "machine" had "disappeared" by leaving behind a luminous trail "the size of a stovepipe." Aimé Michel mentions that there was a case in Meaux on October 11, 1954. He says the case was reported in the newspapers Le Figaro, l'Aurore, le Parisien Libéré for October 13, 1954, and Sud-Ouest and Ouest-France for October 14, 1954. Luc Chastan indicates that in the Seine and Marne in Meaux on October 11, 1954 at an unknown hour, there was observation of an object in the shape of a disc. The source is noted "M.O.C. by Michel Aimé ** Arthaud 1958." An unidentified object was sighted, but with appearance and behavior that most likely would have a conventional explanation. One object was observed by one witness for over three minutes. 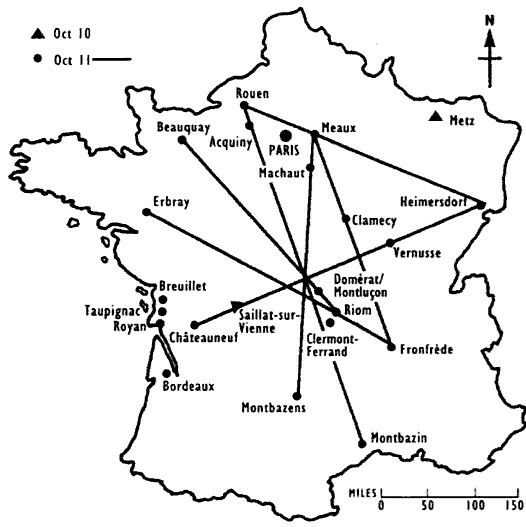 The sources are noted as "Michel, Aime, Flying Saucers and the Straight-Line Mystery, S. G. Phillips, New York, 1958"; "Vallee, Jacques, Computerized Catalog (N = 3073)"; "Vallee, Jacques, Challenge to Science: The UFO Enigma, Henry Regnery, Chicago, 1966"; "Vallee, Jacques, Preliminary Catalog (N = 500), (in JVallee01)". [---] Article in the national newspaper L'Aurore, Paris, France, October 13, 1954. 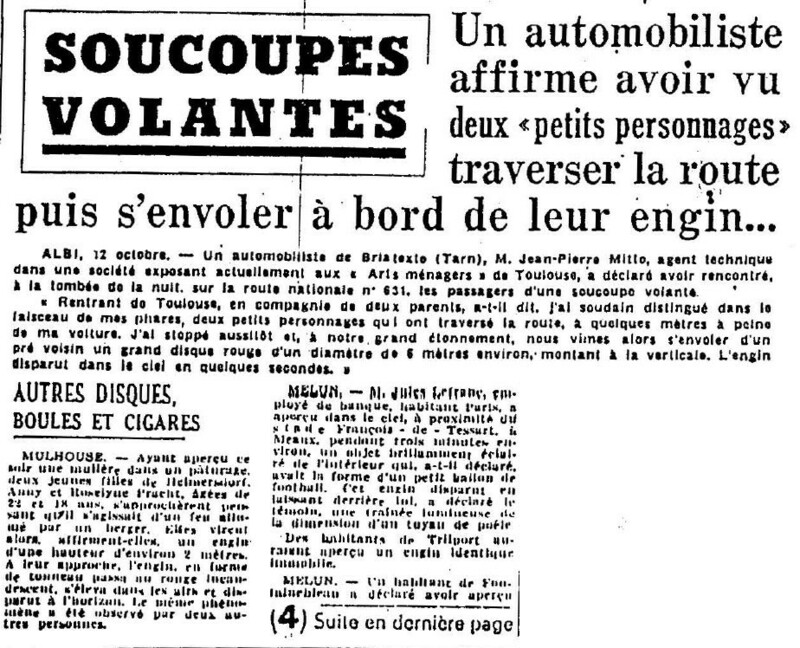 [---] Article in the national newspaper Le Parisien Libéré, Paris, France, October 13, 1954. [---] Article in the national newspaper L'Aurore, Paris, France, October 14, 1954. [---] Article in the national newspaper Le Parisien Libéré, Paris, France, October 14, 1954. [---] Article in the national newspaper Sud-Ouest, Bordeaux, France, October 14, 1954. [---] Article in the national newspaper Ouest-France, France, October 14, 1954. 1.0 Patrick Gross December 20, 2008 First published. 1.2 Patrick Gross September 21, 2014 Additions [ha1], [ud1]. Explanations change from "Not looked for yet." to "Obvious description of a meteor" thanks to the information found on September 21, 2014, in [ha1]. 1.3 Patrick Gross January 4, 2017 Additions [fs1], [ub1]. 1.4 Patrick Gross February 10, 2019 Addition iof the Summary.